Mexico’s exports of HDPE rose sharply in the second quarter of 2016, while exports of L/LLDPE continued a gradual upward trend. Imports of both polymers also trended higher. Major shifts in imports and exports are expected as Braskem Idesa’s new plant ramps up. 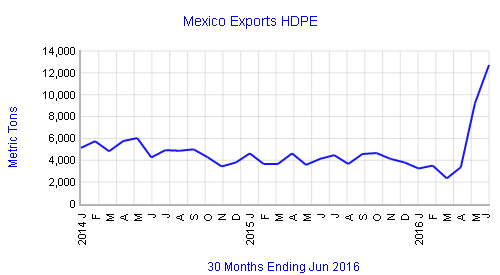 Mexico’s exports of HDPE jumped in May and June, volume YTD of 34,000 tons up 42%. Although shipments to the US accounted for about one-third of the total, exports to that destinations were down substantially from the prior year. Other significant markets for Mexico, most with gains, included China, Cuba, Vietnam, and several countries in the EU and Latin America. Mexico exported 46,000 tons of L/LLDPE through June, up 26%, Colombia, Netherlands, US and Cuba top destinations. Imports into Mexico in the first half of the year were: HDPE, 402,000 tons, up 7%; L/LLDPE 241,000 tons, up 12%. The US, plus a small volume from Canada, accounted for nearly all of the total for both polymers. From: International Trader Publications’ World Trade Reports on HDPE and LDPE. For more information contact: ITP@ITPweb.com.